When one thinks of Passport Game Studios, instantly the beautiful game of Tokaido comes to mind. 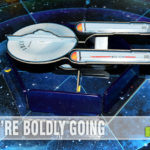 If you’ve never had the pleasure of playing a copy (or seeing one), it is one of the most soothingly-designed board games we’ve ever encountered. And although originally published in 2012, it is still high on the wish lists of many gamers. But Passport Game Studios isn’t one of those one-hit wonders. Over the years we’ve shown you a number of their other great offerings. From Skyward and Salem to Titan Race and Exodus, their catalog of games covers almost every genre and theme. 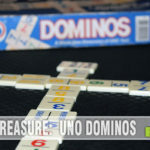 You’d be hard-pressed to find only one title that is perfect for your game night. 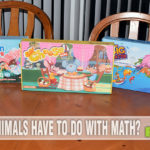 Their latest offering, Fleecing Olympus, is a little different than some of the other Passport games we’ve highlighted. While most of their games are of the standard fare where you wish to be the player with the highest number of points at the end of the game, Fleecing Olympus uniquely does this by requiring you to wager against other players on every turn! To say there’s a “little bit” of player interaction would be an understatement! 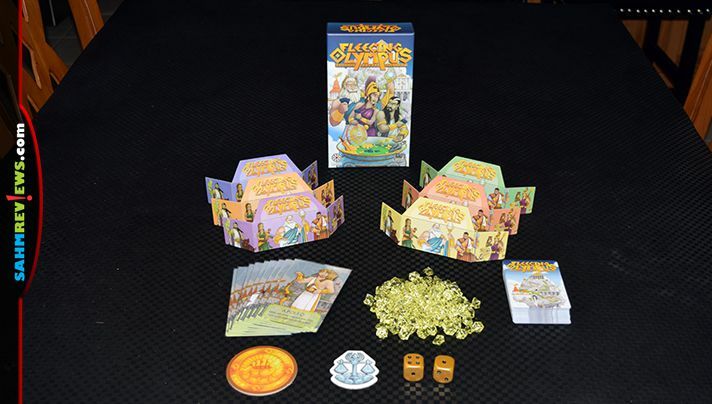 As you might have assumed by the title, in Fleecing Olympus each player (up to six) plays as a Greek god or goddess. 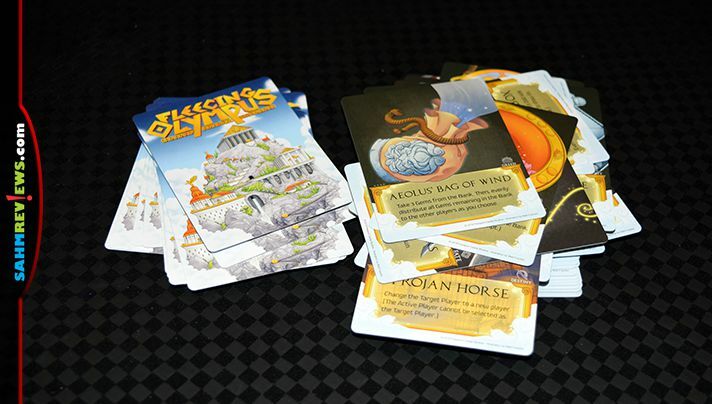 You may choose from the top Olympian god, Zeus, his siblings, Hades, Poseidon and Hera, or his offspring, Hermes, Athena, Ares, Aphrodite and Apollo/Artemis (note – Apollo/Artemis is a promotional card and may not be included in all versions of Fleecing Olympus). These Greek gods are beautifully represented on tarot-sized cards which we immediately housed in protective card sleeves. 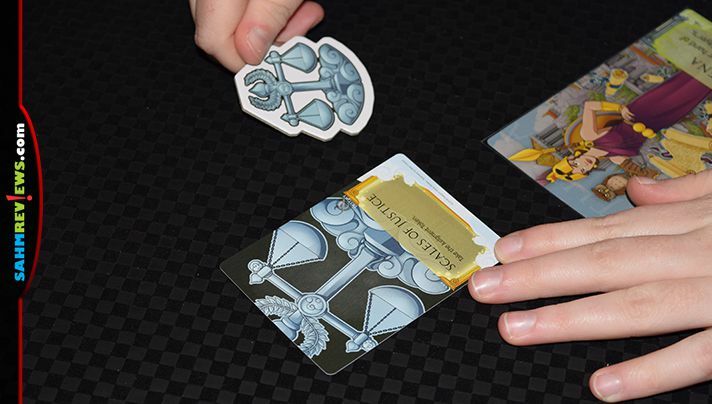 Each participant is randomly dealt one of these Deity cards, a player screen and 20 gems to hide behind the screen. All leftover gems and gods are returned to the box and will not be used. The included deck of 66 cards is shuffled, with five being dealt to each player. Everyone rolls the two golden dice, with the person with the highest roll becoming the first player and taking the even/odd token. The runner up takes the Judgement token and the game of Fleecing Olympus begins. Your turn is divided up into phases which are performed in order. First, looking at your Deity, decide which side of the card you wish to use on this turn. Each side offers a different power and is designated by an “Even” or “Odd” side. Whichever side you elect to activate is placed face-up in front of you and the Odd/Even token is flipped to match the card. The card will allow you to take a special action immediately or somehow change the rules for your turn. Next, you will select one of your opponents as your target and roll the two golden dice. You are trying to roll a result that matches your card selection, even or odd. If successful, the wager amount is determined by the higher of the two numbers rolled. Otherwise, the wager amount begins at the lower number. No gems change hands just yet as now ALL other players have the chance to play cards from their hand. In any order, cards may be played by any player. The first card to hit the table resolves first. All cards are played face-up and are acted upon immediately. If there seems to be a tie, the player with the Judgement Token weighs in and makes a decision as to who goes first. The first card played by each player costs nothing to play. Each additional card they wish to play will set them back one gem, which is paid to the bank in the center of the play area. These cards will alter the value of the wager, prevent other card types from being played, affect the dice result, resist other cards played or even manipulate gems in the bank! Players continue to play cards from their hand until everyone elects to pass by declining to play additional cards. During this time, negotiations, bribes and threats are not only legal, but encouraged. Any agreements are binding for the current turn only. If you make an agreement for something to happen on a future turn, it is up to the other player whether or not to honor your deal. At any time during the card-playing phase, the owner of the Judgement Token may declare the turn over by calling out “STOP!”. This can be through their choice or by negotiation with any other players, including the active one. This stops the turn immediately and the wager becomes final and due. 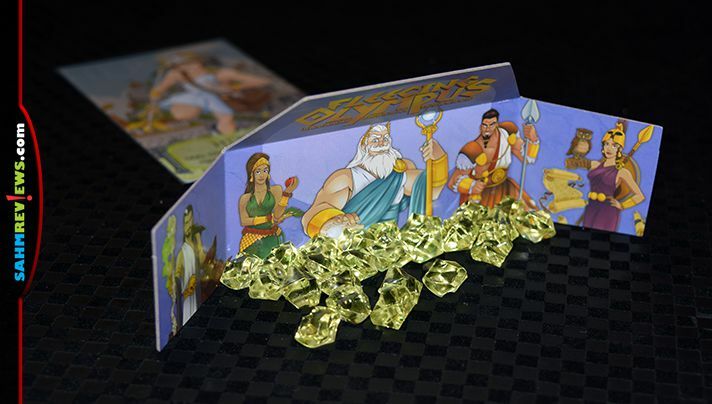 The player owing gems pays for their wager using the gems behind their screen. If they do not have enough, they simply pay as many as they can. 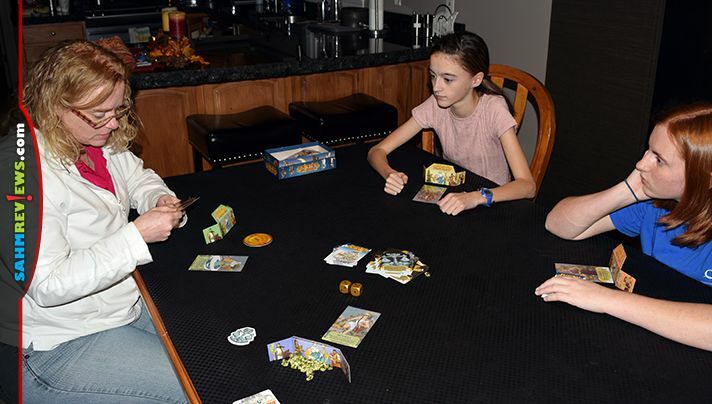 The dice and Even/Odd token are passed to the next player to the left, and the Judgement Token is awarded to the player who had to pay out the wager. Any played cards are discarded and all players draw back up to five cards in their hand. Another turn is then begun in the same fashion. The game ends when the draw deck runs out during refilling (3-4 players), runs out a second time (5-6 players) or when only one player has gems behind their screen (checked between turns). Players remove their screens to reveal any gems they have behind it, and the person with the most gems wins Fleecing Olympus! 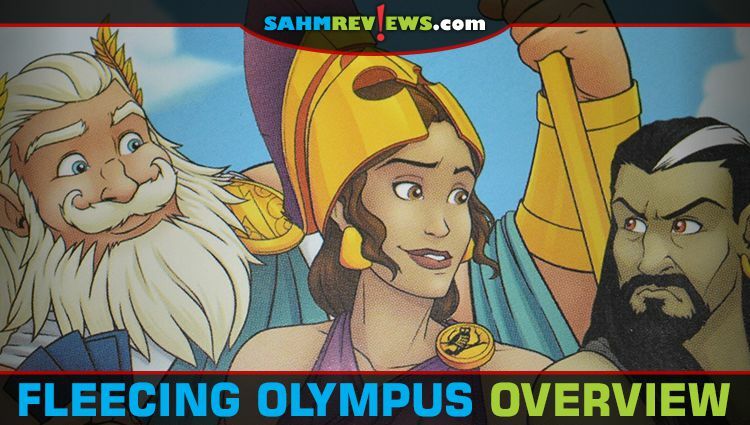 Ringing up at under $25, Fleecing Olympus is small enough to also be considered a great travel game solution. 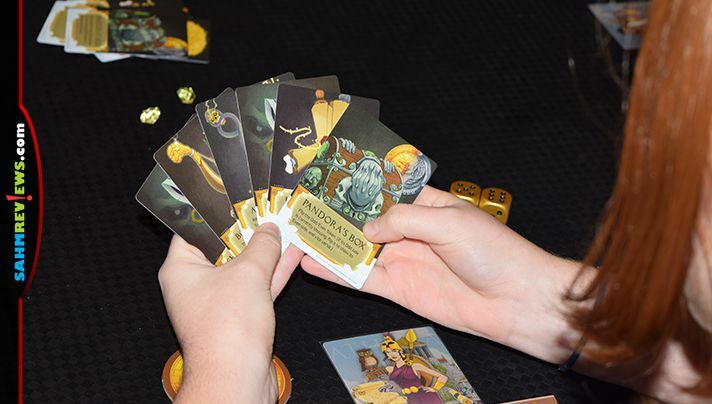 With a ton of player interaction and themed with the most popular Greek gods, you won’t go wrong by putting a copy under the tree this holiday season. And as always, see what else Passport Game Studios might have up their sleeve by following them on Facebook or Twitter! Love this idea for a game! I like that you can play as a God or Goddess, that’s cool. I also think it’s funny that it’s encouraged to threat or bribe other players. That adds a neat element not seen in most other games. I love interactive games and I’ve not heard of this one but it would be a great one to find for the grand kids visit. Sounds like a lot of fun. 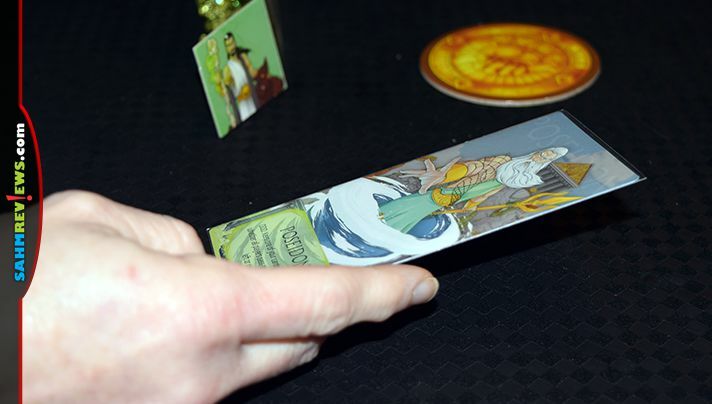 This game looks amazing – I love the artwork and that it features Greek gods and goddesses! I love games where the kids (and adults!) learn while they’re having fun. This looks like a great family game. How cool is that! You can actually choose to play as a God or Goddess, Games like these are the ones we love to play!